A go-to garage door opener, the Chamberlain WD832KEV is a belt drive opener that delivers quiet, reliable performance. This popular model installs easily and requires little maintenance over the years. The Chamberlain WD832KEV offers ½ horsepower of lifting power that is efficient and much quieter when compared to a chain drive garage door opener. The belt is reinforced with steel to stand up to the demands of lifting a garage door day in and day out, and a Posilock antitheft mechanism is a safeguard against attempts at forced entry. Investing in a home security system can also put your mind at ease when it comes to forced entry. One of the best things about this model of garage door opener is that it includes Chamberlain’s Motor Vibration Isolation System, which dampens vibrations and greatly minimizes the noise produced when opening or closing the garage door. This makes it a great choice for attached garages or those with living space up above. The Chamberlain WD832KEV is also myQ compatible, but it doesn’t have built-in Wi-Fi. So to take full advantage of the smart features of this garage door opener, you’ll need to purchase and install the Chamberlain myQ Internet Gateway device. If you do, you’ll be able to check whether the garage door is open or closed, give access to visiting family and friends, or close the garage door with the push of a button from miles away. A budget garage door opener can still get the job done and offer you the convenience and security you’re looking for. Case in point: the Chamberlain C205. This chain drive garage door opener is small but mighty and carries an affordable price tag that won’t break the bank. For under $150, this garage door opener covers all of the bases. Carrying the Chamberlain name, the C205 gives you the equivalent lifting power of a ½ horsepower. That doesn’t sound like much but used in combination with a heavy-duty chain drive system, it’s enough to lift your standard 7-foot garage door. In addition, the Posilock antitheft system ensures that once you’ve closed the door it stays shut. Even though this is a chain drive garage door opener, customers note that the output of noise during operation is better than they anticipated. The Chamberlain C205 is compatible with the brand’s popular MyQ garage door hub, so that is a bonus if you want to spring for the option of monitoring your garage door remotely. Don’t ever worry about leaving your garage door open again with the Chamberlain C870 Smart Garage Door Opener. This powerful and well-equipped opener has built-in Wi-Fi and can tell you when the door opens, closes, or is left open too long. Chamberlain has brought garage doors into the 21st century with their myQ app that allows you to check the status of your garage door from anywhere. However, you usually need to buy and install a separate hub to make this possible. The Chamberlain C870 eliminates the need to purchase a separate hub because it's equipped with built-in Wi-Fi. After installing the opener, follow the manufacturer’s instructions to connect the unit to your home’s internet connection and then download the myQ app for instant control of your garage door. The myQ technology onboard this Wi-Fi garage door opener makes it compatible with a variety of smart home systems, too. Control your garage door with Google Home, Nest, Wink, IFTTT, or Xfinity Home. Note that myQ requires you to pay a subscription fee to gain access to some of these services. Aside from this garage door opener’s smarts, people find the chain drive operation to be reliable and surprisingly quiet. The smooth action and heavy-duty chain make the opening and closing process quick and efficient. For a garage door opener that delivers a high-end experience and superior features, look no further than the Chamberlain B1381 Smart Garage Door Opener with Battery Backup. This powerful garage door opener has the equivalent of 1 and ¼ horsepower, giving extra lifting power to the belt drive system. It can lift even heavy paneled garage doors, according to users. Where it really shines as a high-end garage door opener is in the features category. Most notably, the overhead light delivers superior illumination when compared to many other models of garage door openers. There are 100 LED diodes on a light board that provide excellent lighting conditions in the garage—which is especially useful if you use the space as a workshop, for hobbies, or performing car repairs. The lights can be controlled with a motion sensor or manually, and there is an automatic shut-off feature available. In the event of a power failure, you’ll appreciate that this model comes equipped with an onboard battery backup. The Chamberlain B1381 is also compatible with MyQ, so you can check to see if you left the garage door open (again). Even better, though, is the fact that you can set this high-end garage door opener to automatically shut after a specified period of time. We also like the fact that the control pad has received a 21st-century update and features an LED display that by default displays the current time. In the event of an issue, the display will give you an error code so you can diagnose and correct the problem. Between the lifting power, incredible illumination, smart door capabilities, and informative LED keypad, this high-end garage door opener is a worthwhile upgrade for your home. It’s pricey when compared to the most basic models of openers but gives you plenty of reasons to splurge on this reliable model. Interested in checking out more smart home devices? Take a peek at some of the other best smart home devices. Belt drive garage door openers have become very popular for their quiet and smooth operation. The Genie SilentMax 750 is a great pick if you want a garage door opener that won’t rattle and shake your whole house every time someone enters or exits the garage. The SilentMax 750 is exceptionally quiet, as the name implies. In fact, users say that it’s “whisper quiet” and “doesn’t disappoint.” The only noise, according to one reviewer, was from the hinges and panels of the garage door itself. Otherwise, this belt drive garage opener runs smoothly and quietly. This model doesn’t compromise on power either; it has the equivalent of ¾ horsepower to quickly and easily lift garage doors and a load up to 500 pounds. It's important to note that while this model can handle a 7-foot garage door, and an extension kit is available for up to an 8-foot door, there is no option for a 10-foot door. For a garage door opener that is quieter than your typical chain-drive model, consider the convenience of a screw drive garage door opener. These openers use a threaded rod to push and pull a trolley that lifts and lowers your garage door with ease. The Genie MachForce is our top pick for a powerful screw drive garage door opener. This model is equipped with a 2-horsepower motor to handle all your lifting needs. Unlike chain drive openers which may need periodic adjustment, a screw drive system requires little maintenance and is faster than both chain and belt drive garage door openers. People frequently comment on the speed at which the MachForce opens the garage door, with one person reporting that it cut opening time by a third. A screw drive system is quieter than a chain garage door opener, but not quite as quiet as a belt driven garage door opener. It offers plenty of lifting power though, and it's a good choice if you don’t want to worry about frequent maintenance. However, some people report that this type of garage door opener isn’t as reliable in extreme temperature ranges, so that’s something to consider if you live in such a climate. If you're on the fence, don’t let the difference in mechanism scare you away from opting for a screw drive garage door opener, as most people found the Genie MachForce to be fairly simple to install. Another unbeatable option when it comes to screw drive garage door openers is the Genie Excelerator 1 HP Screw Drive Garage Door Opener. 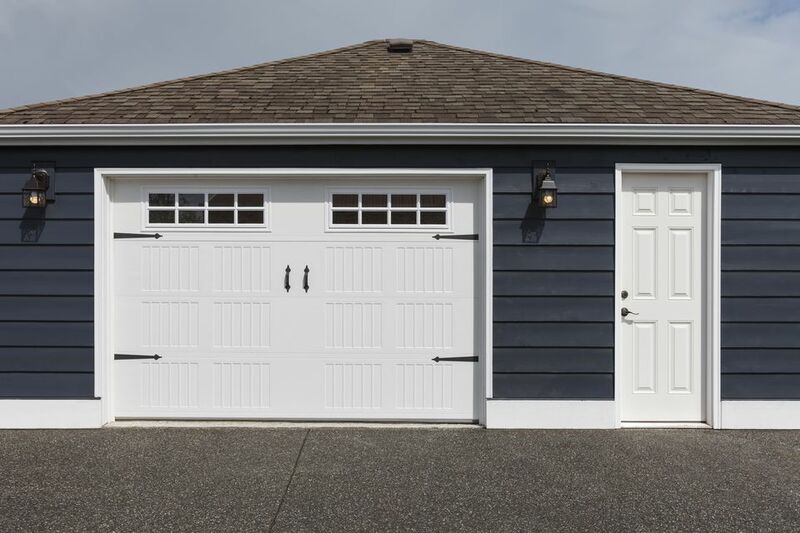 This model has a proprietary direct screw drive that delivers exceptional power for ultra-fast opening and long-term durability, even for the heaviest of garage doors. The Genie Excelerator is powered by a 1 HP DC motor, which can smoothly and quietly open garage doors up to 8 feet tall (as compared to AC motors). It has an enclosed, reinforced C-channel rail system, as well as two pre-programmed remotes, a wireless keypad, and a multi-function wall console that has a vacation lock and light control button. Because there are fewer moving parts with this set-up, there are fewer parts that can break. Plus, the company is so confident in the durability of this product that they provide a limited lifetime warranty for both the motor and screw drive. Arguably, the best part about this purchase is that it includes professional installation from a Genie professional. All you have to do is sit back and relax as someone else sets up your new garage door opener! Save overhead space by opting for a wall-mounted garage door opener, like the LiftMaster 8500 Elite Series. Also called a jackshaft garage door opener, this model mounts to the side of your garage door and does its work from there. The advantage of the wall-mounted LiftMaster 8500 is the fact that it frees up overhead room in the garage since it skips the usual track necessary to lift the door from above. People that use their garage as a man cave or want more ceiling space for storage (like hanging bikes) will appreciate the extra room. Another bonus of the LiftMaster 8500 is the included garage door deadbolt that can be set to automatically lock. This extra security measure makes it tougher for someone to manually pry open the garage door. This model was described by one user as the quietest and most secure garage door opener they’ve ever had, and that makes sense—since the noise and vibration of the opener are centered on the exterior wall of the garage, rather than the ceiling. However, the biggest complaint about the LiftMaster 8500 is that the connection to myQ is unreliable—users have had mixed success getting the unit to communicate with their smart device. If your garage doubles as your workshop—or hangout spot—then you might appreciate a garage door opener with a few more features and accessories. The Ryobi GD201 sets itself apart with its many available add-ons to make your garage more functional—or more comfortable. This belt drive garage door opener gives you plenty of lifting power with 2 horsepower and is very quiet according to users that switched from chain drive garage door openers with less power. The opener is compatible with a number of different accessories offered by Ryobi, including a Bluetooth speaker, fan, and extension cord reel. There are 7 ports that you can plug these accessories into—making this garage door opener a great choice for people that use their garage as a workshop or a spot to relax on a Saturday afternoon. People point out that the extension cord reel is very helpful with all sorts of projects in and around the garage, and that the fan is a nice touch on a hot day. The Ryobi GD201 also has a battery backup that can be powered by one of Ryobi’s interchangeable One+ batteries. Just know that the battery itself is sold separately, or you can use one that you have on hand for other Ryobi One+ tools. This garage door opener is also Wi-Fi compatible, you’ll just need to install a small included relay hub during the set-up process. After that, you can monitor and control the opener via the Ryobi app—but you should know that users report the smart functionality is spotty and complaints about the app are frequent. If you're looking to upgrade your garage or workshop, take a peek at some of the best garage heaters available online. Our reviewers tested a top-rated garage door opener daily for over a week. To get the most comprehensive results possible, they installed it themselves and observed how it performed. We asked our testers to consider the most important features when using this garage door opener, from its drive type to its security features. We've outlined the can’t-miss points here so that you, too, know what to look for when shopping. Horsepower You’ll also want to consider the horsepower of your opener. Typically, 1/2 horsepower will work for most doors in newer homes. If you have a heavier solid wood door, though, you may want to opt for 3/4 horsepower so it can lift it with ease. You can also get 1 and 1 1/2 horsepower models, but those are a better fit for commercial or special situations. Security Since 1993, all garage door openers have been required to have a special reversing mechanism to prevent closure if a child, pet, or car is in the way — but in terms of additional security features, you get what you pay for. If safety is a top concern, opt for a model that changes the access code after each use to prevent a break in. “This is not a simple thing to install,” cautioned one of our testers. “It's likely that you’ll make a few trips to the hardware store even if you’re very handy and have a relatively complete set of tools.” That said, our reviewers thought that this opener’s instructions themselves were very clear and that once setup was complete, the device “worked without lots of fiddling.” Another plus was its added security features, like keyless entry and smartphone app integration. Lastly, our testers did wish it had a built-in camera to allow surveillance in the garage at all times.